After watching last weeks food and drink I was inspired by Monica Galletti cooking with her children at least once a week. I thought if Monica can do that then I’m sure I can try as well. It probably won’t involve spinach but I can do something. I’m sure I can find something they can help with, be proud of and eat! So last Thursday after school I said we were cooking tea together – a chicken pie. They were so excited! I had already bought some puff pastry that was lingering in the fridge with no purpose – so I was all ready. I love pies, especially puff pastry pies so here it is. I don’t really measure anything and if you just fancy throwing in some carrots or curly kale then go for it. It’s in your hands. 2. Gently fry your onion in the oil for about five minutes until nice and soft. I used a pampered chef vegetable chopper which is perfect for children (under supervision) to chop vegetables. 3. Get your children to add the tomato puree and garlic and continue frying for a couple of minutes. 4. Cube your chicken breasts and let your children add it to the pan. 5. Lightly brown your chicken in the pan with the onion, garlic and tomato puree. 6. 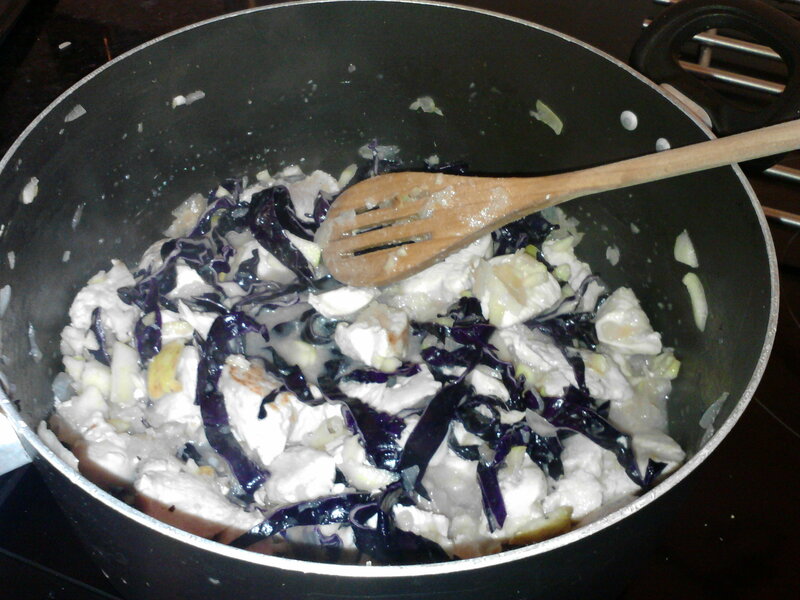 Slice up your red cabbage and chop your apple. 7. Add to the pan along with the apple juice and a touch of salt and pepper. Don’t be worried about adding a touch of salt. Children need a little salt and it brings out the flavour of the pie. 8. Simmer everything together for 10 or 15 minutes. 9. Get a dish big enough to hold the pie mixture. 10. When ready pour the mixture into the dish. 11. 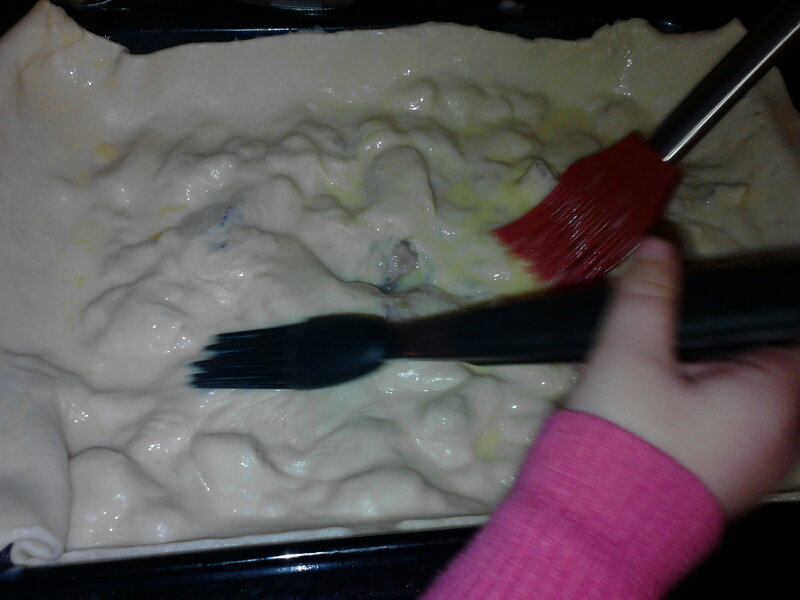 Unroll your puff pastry and lay it on top of the pie dish. 12. Ask your children to crack the eggs into a cup and add a teaspoon of milk. 13. Now paint the pastry with the egg wash using a pastry brush (or their hands if lacking a brush). 14. Pop into the oven for about 30 minutes until the puff pastry is nice and brown. Serve with some new potatoes. Totally delicious and my children loved it! 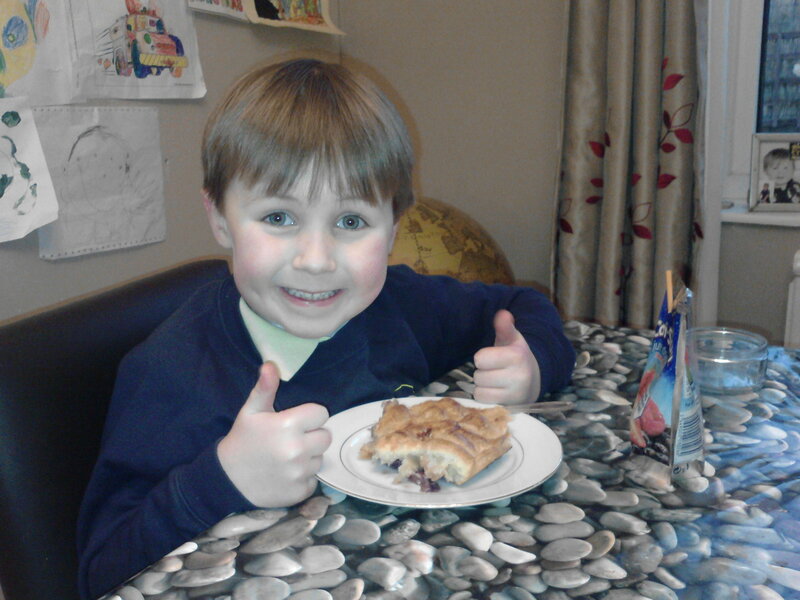 Let them egg wash the pastry – this was their favourite bit! This entry was posted in The Building Blocks of Baking and tagged baking with children, chicken and apple pie, Chicken pie, Chicken pie for children, Cook, cooking with children puff pastry, Fruit and Vegetable, Home, Onion, ow to encourage children to cook, Pastry, Puff pastry, puff pastry pie with children, red cabbage and chicken pie. puff pastry chicken pie, Wine tasting descriptors. Bookmark the permalink. 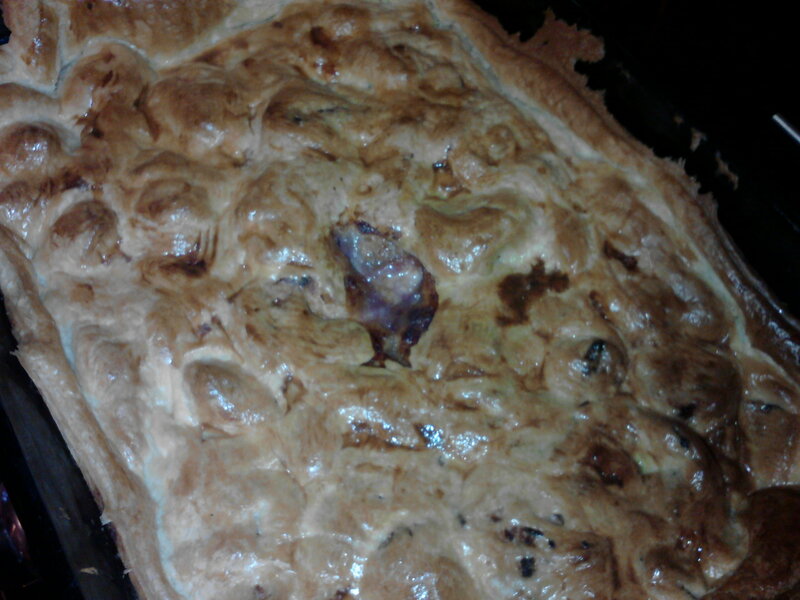 1 Response to Chicken, apple and red cabbage puff pastry pie ..